Concerned about someone with Alzheimer's or other dementia? 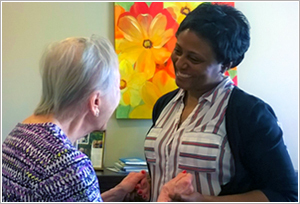 Visit Journey Senior Living of Merrillville, northwest Indiana's only standalone community devoted to memory care. Tour our comfortable apartments and common areas, and learn about the activities that keep Journey Senior Living's residents active and engaged. Call (219) 525-4123 to schedule your visit. Ample one-on-one attention at Journey Senior Living in Merrillville enables seniors with dementias to live to their fullest. Appropriate activities keep residents alert mentally and moving physically. A low ratio of caregivers to residents means that families can count on prompt and courteous assistance with their loved one's activities of daily living. Gary Metropolitan, Lake County, Indiana. My Dad transitioned here from the hospital and they have been wonderful to him. The nurses are constantly watching all of the seniors & I am amazed how on their toes they are with each senior. Dads room is always clean, and everyone is so nice. They are taking such good care of him. Thank you Journey!